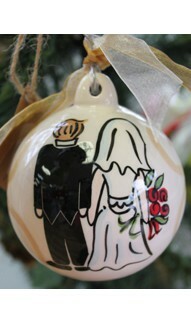 A beautiful collection of Christmas ornaments to decorate your Christmas tree. Fun Christmas ornament, perfect for a friend or neighbor gift. 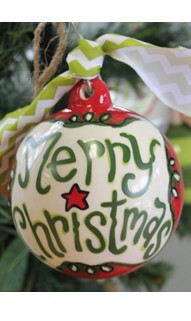 Front is handpainted with the words Merry Christmas. Decorated with a wire hanger, beads and ribbon. 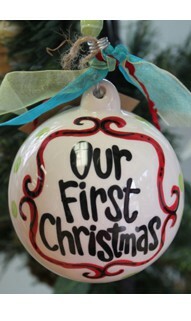 Celebrate her first Christmas with a commemorative ornament. Baby's First Christmas is hand painted around a pink striped baby carriage. We personalize on the back by hand painting. 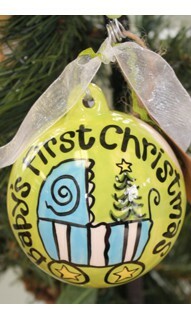 Ceramic ball is hung on a bead decorated wire and ribbons. What we all want for Christmas is some love and joy. Gift this gift of a personalized Christmas ornament to life someone's spirit, and show them they are loved. You said I do and as you begin your life together you will build your Christmas ornament collection. This ornament is a must have. We personalize with names and a date or year.